S Inal, M Er, A Cavusoglu, V Dincel, A Sakaogullari, O Kayiran. Complete Open Dorsoradıal Dıslocatıon Of Trapezıum. The Internet Journal of Orthopedic Surgery. 2007 Volume 9 Number 2. Dislocation or subluxation of scaphotrapezial joint is occasionally seen in patients with degenerative osteoarthritis or the other forms of arthritis. However, traumatic dislocation or subluxation of this joint is extremely rare because of strong ligamenteous complex. Complete dislocation of greater multangular (trapezoid bone) is especially observed via a harsh trauma. Here, a complete dislocation of multangular occurred with self-mutilating trauma is presented as well. The study was performed at the 1 st Orthopaedics and Traumatology Clinics of Ankara Training and Education Hospital . Hand injuries are especially problematic injuries either for the practitioner or the patient, not only for the difficulty of the intervention but also the mental drawbacks. The most unwanted hand injuries deduce after the harsh traumas. However, the traumas such as dislocations result with excellent follow-ups. The traumatic open dislocation of the trapezoid bone is observed rare. With regard to the dislocation treatment, a practical and simple technique is supplemented in order to improve the clinical success. A thirty-year old man self-injured his right hand during cleaning his gun out. The damage of the gun is noted with its blast and thermal effect. The patient applied to the emergency immediate after the injury. At the initial examination, the abduction of the thumb was limited. Thumb sensation was not intact, since the circulation was found satisfactory. There was a 3x2 cm tissue defect on the thenar side of the hand. The scaphoid, trapezoid, first metacarpal and trapezoidal bones were exposed. A bony prominence was palpated on the extensor aspect of the wrist. The roentgenogram of the wrist clearly showed proximal and dorsoradial dislocation of the trapezium (Figure 1). The intervention was carried out under axillary anesthesia. Injured area was irrigated and debrided appropriately. After the debridement, a longitudinal traction along the thumb was applied with a downward pressure over the trapezium in order to push back to its anatomical place. Because the scaphotrapezial joint was unstable and reluxated, the trapezium was stabilized with syringes temporarily which passed from trapezium into the trapezoideum (Figure 2). This maneuver managed an easy and simple reinforcement without an additional force to the bone with favorable fixation. 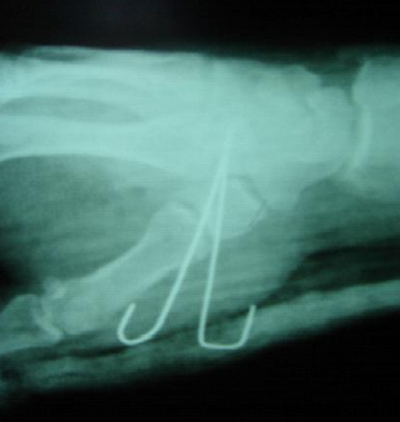 After the control X-rays showed the appropriate fixation, a definitive K-wire stabilization was done (Figure 3). While the reduction and the fixation were established, the scaphotrapeziotrapezoidal, trapeziotrapezoidal ligaments and volar capsule were then repaired. The ligaments between metacarpal and trapezium were intact. With regard to the the volar tendons of the hand and wrist, the thenar muscles were affected solely and partially which were further reapproximated. Median and radial nerves including the radial artery were observed intact. The palmary digital nerves of the thumb were transected entirely at this level. An epineural repair was carried out by a plastic surgeon. The wrist was immobilized by a short arm thumb-spica cast. The cast and K wires were removed at the fourth week. The rehabilitation protocol was handled by a physiotherapist. 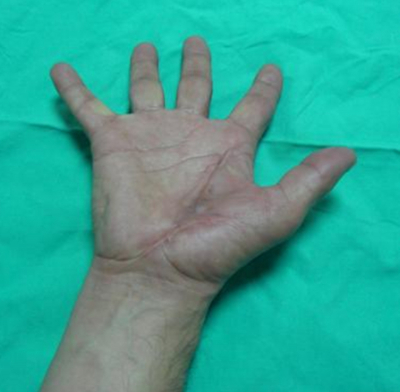 The postoperative period was uneventful except that early epidermolysis of the thenar skin region due to congestion entirely healed with secondary intention within fifteen days (Figure 4). In the follow-ups, an entire pain relief was observed. At the sixth week, K-wires were removed and a full range of motion of the thumb was noted from now on with the collaboration of the rehabilitation program. Figures 5 and 6 clearly indicate the late postoperative period of the hand that healed excellent. The patient was able to move his hand in all actions with maximum range of motion which was also demonstrated in the physical therapy at the end of the first postoperative period. 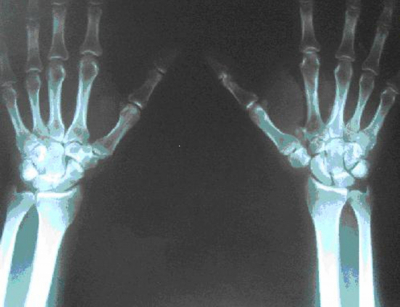 Figure 1: Trapezium showed significant dislocation when it is compared with the patient's other wrist. Figure 2: Peroperative antero-posterior view of the reducted scaphotrapeziotrapezoidal joint with two syringes temporarily passed through the trapezoideum. 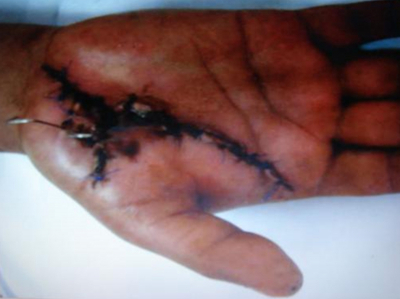 Figure 3: Post operative oblique view of the injured hand clearly shows the definitive fixation with an appropriate reduction that was held with two K-wires. Figure 4: Early postoperative view of the hand. Please note a normal anatomical position is established. 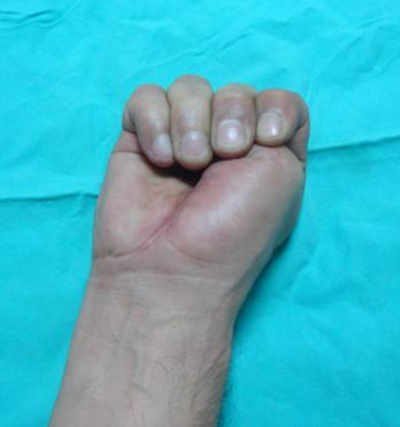 Figure 5: The view of the hand in abduction position at the first postoperative period. Figure 6: The fist clearly shows maximum range of motion at the first postoperative period. Complete, closed dislocation of the trapezium is rare because the ligaments that attach the trapezium to the surrounding carpal and metacarpal bones are quite strong (1). Open dislocation is encountered extremely rare than closed dislocation of the greater multangular. The carpometacarpal joint usually remains intact when there exists a disruption in the intercarpal ligaments. Dislocation can be dorsal-radial or volar-ulnar. The vast majority of the cases in the literature show that traumatic dislocations are usually dorsoradial. Previous case reports reveal a similar mechanism of injury for the complete dislocations. A localized force; single or intermittent, was applied directly over the carpal bone causing the enucleation of the greater multangular (2). In the surgical literature, there seems to be not many cases with regard to open dislocation of the trapezium. Peterson described a few cases (3). Up to now, not many cases more than fifteen were reported as traumatic complete open dorsoradial trapezial dislocation. In this manner, this case seems to be of importance regarding the intervention. Since this kind of injury is encountered rare, there is, yet, no ideal treatment. These dislocations can only be reduced by open techniques, and the reduction is usually unstable unless an intraoperative internal fixation is handled. Open reduction and K-wire fixation would, therefore, appear to be the treatment of choice for the acute injury. Recent studies advocate open reduction and internal fixation or excision of the trapezium depending on the severity of the injury. Boe, Brewood and Sherlock reported acceptable functional results with open reduction and K-wire fixation reinforced with immobilization by plaster for a dislocation of trapezium (4, 5, and 6). Russell reported a case in which reduction of an incomplete palmar dislocation was not possible, however no functional deficit resulted (7). Goldberg et al. 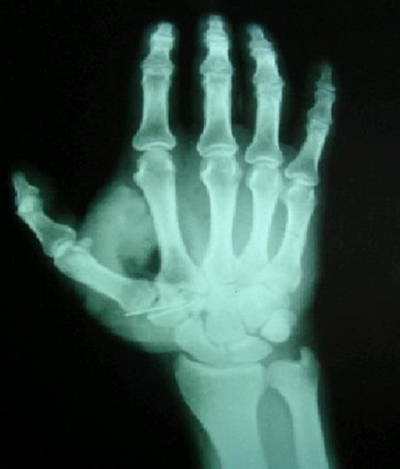 described a patient who had the trapezium excised, which resulted in no functional deficit of the thumb (8). Vente and De Ruiter, and McKie et al. each reported a case of an isolated dislocation in which closed reduction and casting were successful (9,10). These descriptive results suggest that closed reduction should be attempted in cases of acute dislocation of the trapezium. When found unsuccessful, open reduction should be taught the next step. Late excision should be reserved for consecutive failures. The mechanism of injury in our patient was the direct blast effect near to scaphotrapezial joint resulting with an open dislocation of the trapezium to the dorsal aspect. We didn't think that it was an indirect injury transmitted by the first metacarpal to the trapezium through the ligaments. On the basis of the reasonable result in this case and the evidence available in the literature, we consider that the method of choice for initial management must be the open reduction with internal fixation. Excision or atrhrodesis should be reserved for further reasons. When taken into consideration, temporary fixation method in this fracture has not been stated previously in any article. Therefore, the practitioners can safely use intraoperative temporary fixation techniques with various materials such as syringes on the way to the definitive treatment. 1. Ehara S, El-Khoury GY, Blair WF. Scaphotrapezial dislocation: a case report. The Journal Of Trauma. 1988;28(11):1587-1589. 2. Siegel MW, Hertzberg H. Complete dislocation of the greater multangular(trapezium). A case report. J Bone Joint Surg Am. June 1969;51(4):769-772. 3. Peterson CL. Dislocation of the multangulum majus or trapezium and its treatment in 2 cases with extirpation. Arch Chir Neerlandicum. 1950;2:369-376. 4. Boe S. Dislocation of trapezium(multangulum majus). A case report. Acta Orthop Scand. 1979;50:85-86. 5. Brewood AFM. Complete dislocation of the trapezium: a case report. Injury. 1985;16:303-304. 6. Sherlock DA. Traumatic dorsoradial dislocation of the trapezium. J Hand Surg. 1987;12A:262-265. 7. Russell TB. Intercarpal dislocations and fracture dislocations. A review of fifty-nine cases. J Bone Joint Surg(Br). 1949;31:524-531. 8. Goldberg I, Amit S, Bahar A, et al. Complete dislocation of the trapezium(multangulum majus). J Hand Surg. 1981;6A:193-195. 9. Vente JP, De Ruiter K. Complete dislocation of the trapezium multangulum majus. Neth J Surg. 1983;35:33-35. 10. Mc Kie LD, Rocke LG, Taylor TC. Isolated dislocation of the trapezium. Arch Emerg Med. 1988;5:38-40.